Hope junior Joel Rietsema of Rockford (Rockford HS) achieved NCAA Division III All-America status by finishing fourth in the 800-meter run in competition held in Claremont, Calif. Top-seeded Jake Waterman of Wabash, Ind. won the event in 1:49.41. Rietsema, seeded seventh in the nine-runner final, was timed in 1:50.72. He becomes Hope's second alltime NCAA All-American in the 800. The other was Steve Rabuck who was eighth at nationals in 2001 (1:51.86). 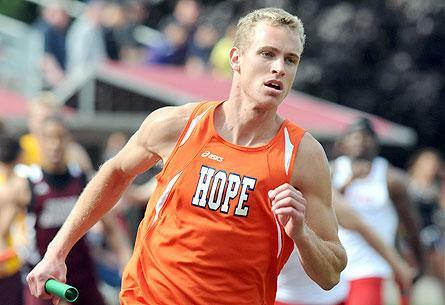 Rietsema earlier this spring established the Hope College record for the event (1:50.32). He was the MIAA champion in the event with a league record time of 1:52.15. Rietsema was one of three Hope athletes to compete in the national championship. Junior Sarah Venlet (Zeeland/Holland Christian HS) just missed qualifying for the finals in the 400-meter hurdles as she finished 11th among 22 competitors. The top nine finishers in the prelims advanced to Saturday's finals. Competing at nationals for the third consecutive year and seeded 16th, Venlet was timed in 1:02.74. The last qualifier for Saturday's finals was clocked at 1:02.45. The best prelim time was recorded by Tashina Mc Allister of Wartburg in 1:00.77. Venlet had finished 14th at the national meet as both a freshman and sophomore. Sophomore Sheri Mc Cormack (Holland/West Ottawa HS) missed qualifying for the finals in the 1,500 by less than a second as she finished 14th in Thursday's prelims. The top 12 finishers advanced to Saturday's final. Mc Cormack was timed in 4:41.54 while the time of the 12th qualifier was 4:40.76. Mc Cormack, competing at nationals for the first time, was seeded 15th among the 22 qualfiers. The best time in the prelims was recorded by Margo Cramer of Middlebury in 4:34.22. Hope College has presented an honorary degree to author Susan Howatch of England for her rich and authentic exploration of the spiritual journey as her characters wrestle with their lives and consider the role of the Christian faith as they do so. Eleven Hope College athletic teams will receive the 2011-12 GPA Team Award from the Michigan Intercollegiate Athletic Association (MIAA). The MIAA Team GPA Award is presented to conference teams that achieve a 3.300 or better grade point average for an entire academic year.